Kayaker at Confluence Park. Flickr.com. Kimon Berlin. Photo published: 9/28/2013. The Big Thompson Watershed Coalition is hiring a Project Manager. Under the general direction of the Director, the Project Manager leads all tasks related to BTWC’s river restoration, stewardship, forest restoration, and outreach/educational projects. 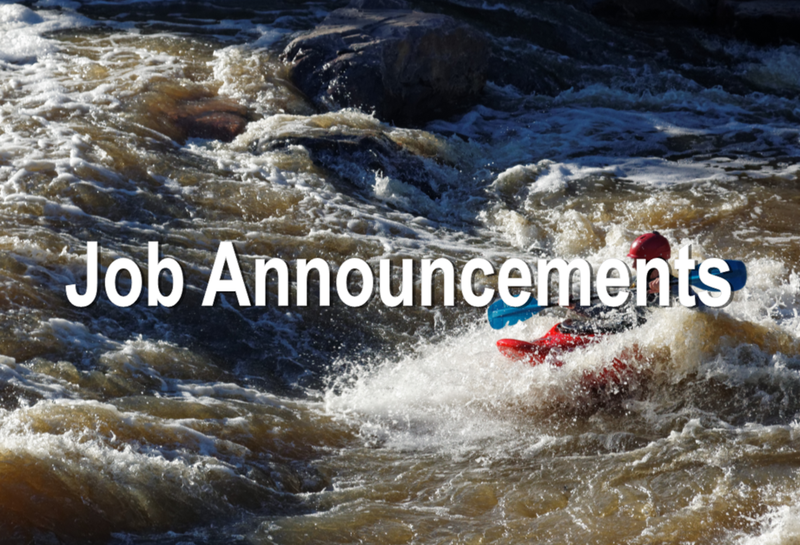 The Project Manager is responsible for carrying out tasks related to the management of the Big Thompson Watershed Coalition’s flood recovery river projects, ongoing monitoring and adaptive management river projects, and other project management tasks as assigned by the Director. Application deadline is October 4, 2018. For more information and how to apply click HERE. City of Fort Collins is hiring a Forestry Technician II, who maintains the health, safety, and aesthetics of public trees within the City of Fort Collins. Operates a variety of power tools and specialized equipment in the performance of these duties. Strong focus on pruning trees of all sizes using rope and saddle techniques, structure pruning of small trees, large tree removal, and tree planting following industry and division standards. Deadline to apply is 3:00 PM. MST on October 8th, 2018. For more information, click HERE. Larimer County is hiring a Natural Resources Director, who leads and directs the programs and activities in the Natural Resources Department including Parks, Open Lands, and Lands Stewardship (Weeds and Forestry). Oversight areas include management, recreation, and development of US Bureau of Reclamation Reservoirs, management and use of allocated Colorado Lottery Funds, acquisition, development, and management of County open spaces and trails, County Weed Control District and Enterprise Fund, and County Forestry. Significant interaction with municipalities, the County Parks Advisory Board, the County Opens Lands Advisory Board, Land Stewardship Advisory Board, and other agencies to further the Board of County Commissioners' (BOCC) Natural Resources agenda and projects. Receives general direction from the Director of Community Planning Infrastructure and Resources. Deadline to apply is October 14th, 2018. For more information, click HERE. Colorado Department of Natural Resources is hiring a Statewide Education Coordinator. This position serves as the agency's expert in formal education, specifically focused on professional development of educators; wildlife and natural resources education activities for a variety of formal groups and audiences; and serves as the agency expert on designing state education standards-based activities and programs. This position is responsible for planning, directing and overseeing the overall function and operation of standards based education programs within CPW including the Schools and Outdoor Learning Environments Program, Colorado Project WILD, and the Colorado Archery in the Schools Program and the training/curriculum materials associated with each program. Deadline to apply is October 28th, 2018. For more information, click HERE. Northern Water is currently looking for a Water Quality Department Manager. Duties include planning and directing personnel and all aspects of Northern Water’s activities concerning water quality. Identifying water quality issues that may affect the organization and its allottees and developing and implementing plans to maintain compliance with pertinent local, state and federal regulations and to protect system water quality and water supply. For full job description, click HERE. Position is open until filled. PublicHealth.org, is a site dedicated to meeting the growing need for public health professionals by connecting students with opportunities to begin and advance their careers. With a predicted growth rate well above the national average and an established workforce, public health is an excellent industry for a new student to begin a career. To meet this demand, they have expanded their site’s career and state resources. For students seeking information about public health in their state, they have created state-specific guides that answer important questions. The page for Colorado can be found at: https://www.publichealth.org/online-degrees/Colorado/.